From GIFs to cinemagraphs to three-dimensional graphics, motion design has steadily evolved over the past three years. Heavily influenced by pop culture, designers have pushed the boundaries of what is possible, experimenting with new trends that entertain us or make us think. Here’s a look at the major trends in motion design over the past three years, what you can expect in 2019, and where it’s headed. TNT • Turner • 22nd Annual SAG Awards from Giant Ant on Vimeo. Both film and motion graphics started to move toward custom, seamless transitions, rather than physical edits that “cut” between two scenes. Designers used transitions to their advantage, making them fit the overall look and feel of the project, rather than relegating them to the world of necessary edits. I guess we’d be cheating if we captioned this “so cool,” but here we are. Well, it is. Outstanding work by Cecilia Erlich. Animated GIFs were not a new thing in 2016; however, more and more mainstream sites had started to embrace them: Twitter announced support for GIFs in 2014 and Facebook began allowing users to add GIFs to their status updates in mid-2015. This momentum carried into 2016, when brands and designers continued to experiment with this quick image format. Video continued to dominate, with GIFs and animated memes taking over the internet. As a result, marketers were looking for a way to stand out and do something different. Enter cinemagraphs: a still image (usually a photograph) incorporating a minor, repeated movement on a loop. This combination of static imagery with animation is eerie and otherworldly, but major brands from Apple to Nike to HBO’s Game of Thrones experimented with them. By MORPHINE. A GIF animation created for UY!CG, a computer graphics convention in Uruguay. These pop culture phenomenon also made an impact on design, with retro colors, typography, and icons making their way into mainstream visuals. More designers leveraged 3D effects to display scenes that would have otherwise been impossible to create. For example, Apple’s video (below) announcing the Apple Watch Series 4 not only provided an up-close and personal view of the device, but it also allowed Apple to take you inside the watch by visualizing the updated hardware. Most often used in car commercials, visual effects allows designers to portray a dramatized, epic version of their product. Adidas FW18 "Deerupt" Teal:Black from Elastic on Vimeo. In the Adidas video above, you see detailed, stylized shots of the shoe, with the mesh coming together to build the exterior of the shoe and even see the stitches being sewn in for the final touch. Fast-forward to 2019 and it’s hard not to notice the resurgence of kinetic typography, from commercials to websites to music videos. Kinetic Aesthetic 2.2, a concept piece by Feint. We’re mesmerized by the rotating cylinder of WORKFLOW. Clean, crisp shapes add an elegant, simple feel to motion design, but can also run the risk of being too sterile. That’s where the grain comes in — an effect used to add noise and texture to images that would otherwise feel dull and lifeless. The result? The added rough texture can make your visuals feel more relatable and relevant. Motion design adapts with the times. It’s easy to imagine how growing trends like artificial intelligence and virtual reality could impact design in the next year, setting the stage for truly authentic and customized experiences. Playful, fun GIFs have had their moment to shine, primarily on social media where users want to consume aesthetically pleasing imagery. However, brands are realizing they have a chance to form deeper relationships and evoke real emotions by investing in storytelling. There’s proof this design approach works. Research shows that we are actually programmed to be attracted to good stories. Motion design is perfectly suited to this, leveraging animation and movement to tell a story. Take the animation above, where designer Nick Paradise visually communicates the joy of releasing your product into the world for the first time. 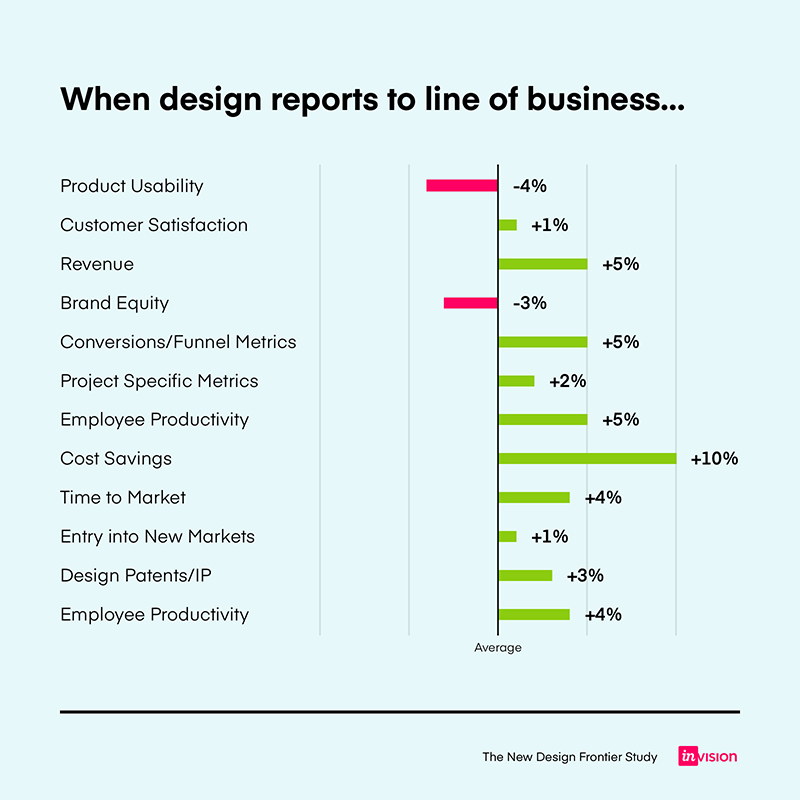 Graph comparing the fiscal implications of design teams reporting to business, as published in our comprehensive report on the state of the design industry. Businesses have always known how good design can impact brand recognition, website conversions, or onboarding experiences. Connecting good design to the bottom line — the financials — always seemed to be missing. However, in recent years, there have been several attempts to measure the business value of design, the latest being a comprehensive report by McKinsey. Over a five-year period, McKinsey tracked the design practices of 300 different companies, awarding them each a McKinsey Design Index (MDI) score. They found that those with a high MDI score performed better financially, increasing their revenues and total returns to shareholders significantly faster than their counterparts. 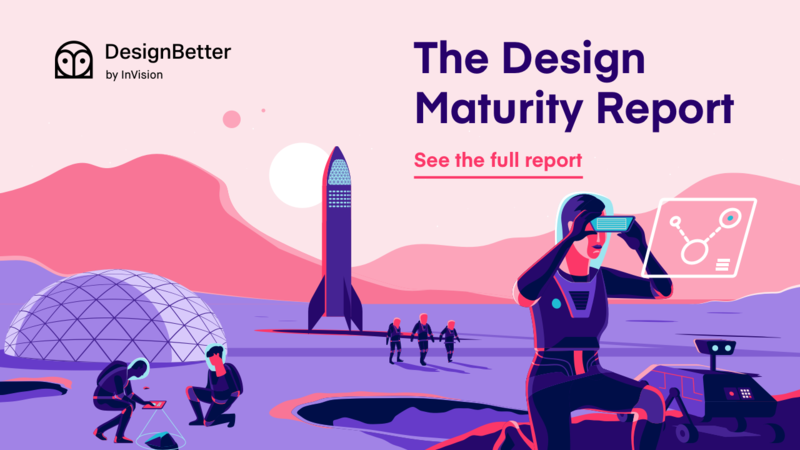 These findings, along with any future reports and studies (including The Design Maturity Report), will change how businesses and designers think about value. More businesses will realize that design has an equal seat at the table and that executives need to have a vested interest in design. And designers will feel empowered to make data-driven decisions and optimize their processes in a way that makes sense for the business. We surveyed 2,200 companies about how they design. What we learned will transform the way you work. Whatever motion design looks like by 2020, one thing is for sure: it will continue to break the rules, push the boundaries, and be bold. Want to learn more about motion design?